4 responses to "Breaking News"
He’s looking a bit frazzled there, and is that a framed photo of Our Beloved Leader in the background?!? I’m fairly certain the phone has been photoshopped, and I’m quite sure the Blair photo is part of the ‘faking process’ as well. 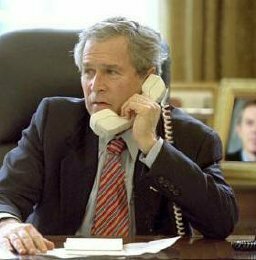 The idea that Dubya actually has a framed photo of Blair on his desk is wonderfully creepy. But surely not plausible. Is it? But surely not plausible. Is it? I reckon it’s real – and I reckon the eyes light up when he wants to speak, just like on Thunderbirds.